This interesting surname is of Anglo-Saxon origin, and derives from the Middle English given name Holbert, itself a development of the Olde English pre 7th Century "Holdbeorht", composed of the Germanic elements "hold", meaning friendly, gracious, with "berht", bright, famous. The popularity of the name is borne out by the number of surnames it has generated; the personal name appears as "Holbertus" (1168) in the Archaeological Records of Kent. The surname dates back to the early 13th Century (see below), and early recordings include: John Holdebert (1219), in the Assize Court Rolls of Yorkshire, and John Hulberd (1524), in the Subsidy Rolls of Sussex. 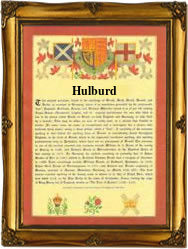 Variations in the spelling of the surname include: Holbert, Holbred, Holbird, and Hulburd. London Church Records list the marriage of Robert Hulbert to Katherine Cowper on May 13th 1577 at St. Bartholomew the Less, and the christening of Thomas, son of George and Mary Hulbert, on May 29th 1626 at St. Martin in the Fields, Westminster. A Coat of Arms granted to a Hulbert family is blue, an ermine bend between six silver mullets. The first recorded spelling of the family name is shown to be that of William Holdebert, which was dated 1205, in the "Pipe Rolls of Warwickshire", during the reign of King John, known as "Lackland", 1199 - 1216. Surnames became necessary when governments introduced personal taxation. In England this was known as Poll Tax. Throughout the centuries, surnames in every country have continued to "develop" often leading to astonishing variants of the original spelling.